No doubt, you want to share some of your own personalities and individuality on your wedding day? So, why not use confetti to do this by capturing your confetti moment in an alternative way. Here are our top 5 alternatives to the classic confetti shot. One of the newest trends when it comes to the confetti moment is to be showered in confetti fired from a Confetti Cannons. They are fun and exciting to use and will help to produce some spectacular photographs as you can get all of your guests involved. Why not have several of the bridal party lined up to set off Confetti Cannons at the same time to cover you, the happy couple, and your guests. 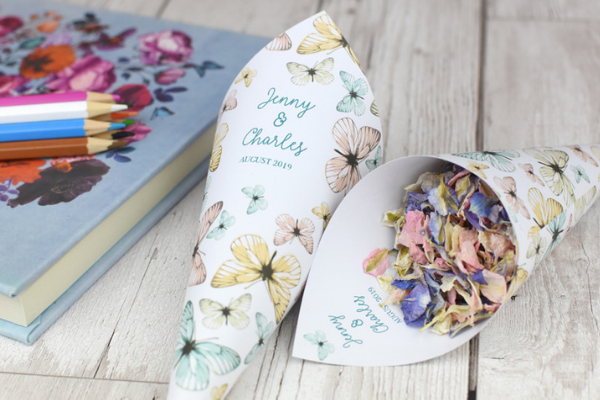 Filled with your choice of natural petal confetti, as petals are released, they will flutter down gently giving your photographer plenty of time to capture some fantastic photographs. After the initial blast, have fun and be silly in the falling petals for a spectacular confetti moment. Confetti Cannons are available in large, which hold the equivalent of 15-19 handfuls of confetti and medium, which hold the equivalent to 3-5 handfuls of your chosen confetti mix. The confetti moment doesn’t have to be just for the newly married couple. Why not add a selection of props and photo frames for some alternative and fun confetti shots. Make sure you order plenty of confetti to ensure you have enough for a variety of group shots to include different members of the bridal party and your guests. Why not supply confetti alongside a photo booth and see how creative your guests can be! Your wedding day will be hectic and will fly by too quickly, so plan ahead and make some time for just the two of you to have some moments together. Use this time to include some intimate confetti photographs. 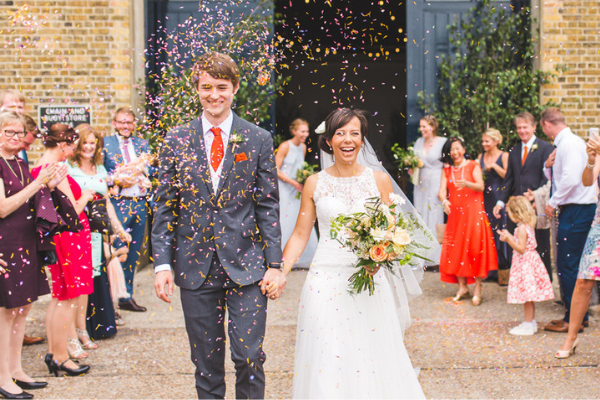 We love a cute photograph of the happy couple blowing their chosen confetti towards the camera, what would you do in your intimate confetti moment? Nothing is cuter on your wedding day than seeing the children getting involved with activities, especially the confetti moment. Take it one step further and make them feel really special by giving them their own confetti moment. Supply each child with a Confetti Wand or a basket filled with your chosen confetti mix for them to throw around, play and have some fun. Your photographer will be able to capture some wonderful natural shots. The confetti moment doesn’t just have to be about the happy couple, get some different confetti shots with your bridesmaids or special family members. Make use of the confetti on the ground after your big confetti moment by asking them to lie down on the petals and get your photographer to take some photographs from above. Why not have some individual confetti moments where guests throw confetti as you dance around, you will love the fun and exciting photographs you receive after your big day. Choosing your confetti couldn’t be easier, simply select from one of the recommended mixes or use the Pick & Mix tool to create your own unique confetti mix to match or contrast your wedding colour scheme. Have fun choosing your confetti and enjoy your confetti moment! 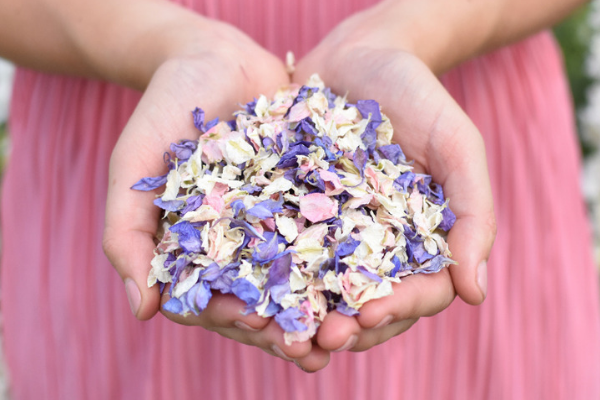 Shropshire Petals are expert petal confetti growers! Their top notch petals are biodegradable, dye-free and environmentally friendly. 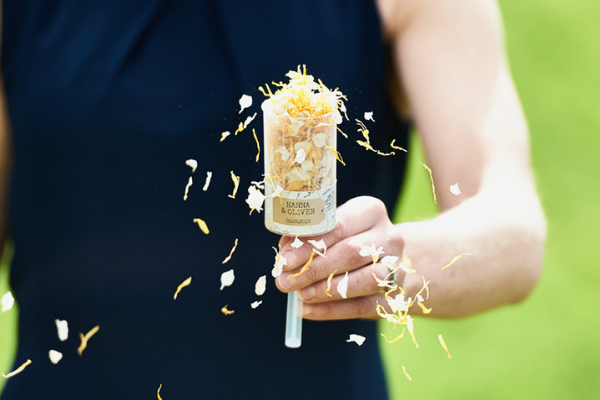 They offer a wide range of colours and display options to surprise your wedding guests, from cannons, personalised cones, pops and even an option to Pick & Mix your unique blend of confetti to match your colour scheme. Come and see us at the National Wedding Show this Spring for the best finishing touches ideas, enter our competition to win confetti for your wedding day, get a free confetti sample and get 10% off orders over £50!